Antelope Canyon is a part of Navajo Nation in Arizona, and has been described as one of the most photogenic places on earth. Although it’s not nearly on the scale of the Grand Canyon, it's arguably just as beautiful and impressive in its own way. It's a slot canyon, with walls as high as 4,000 feet, notable for the beautiful “flowing” appearance of the Navajo Sandstone, an impression created by the running rainwater that floods it annually during monsoon season. 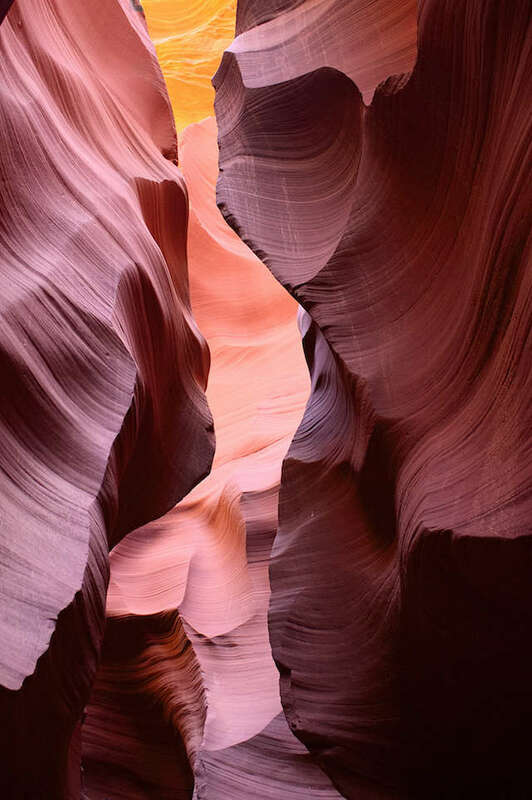 Many slot canyons are too narrow for the light to really reveal the vibrant colors of the stone, but Antelope Canyon is a very fortunate exception to the rule. The shapes and colors of the canyon, as well as the light, can create some truly stunning photographs. Antelope once roamed freely there, eliciting its name. There are really two canyons, the Upper and the Lower.